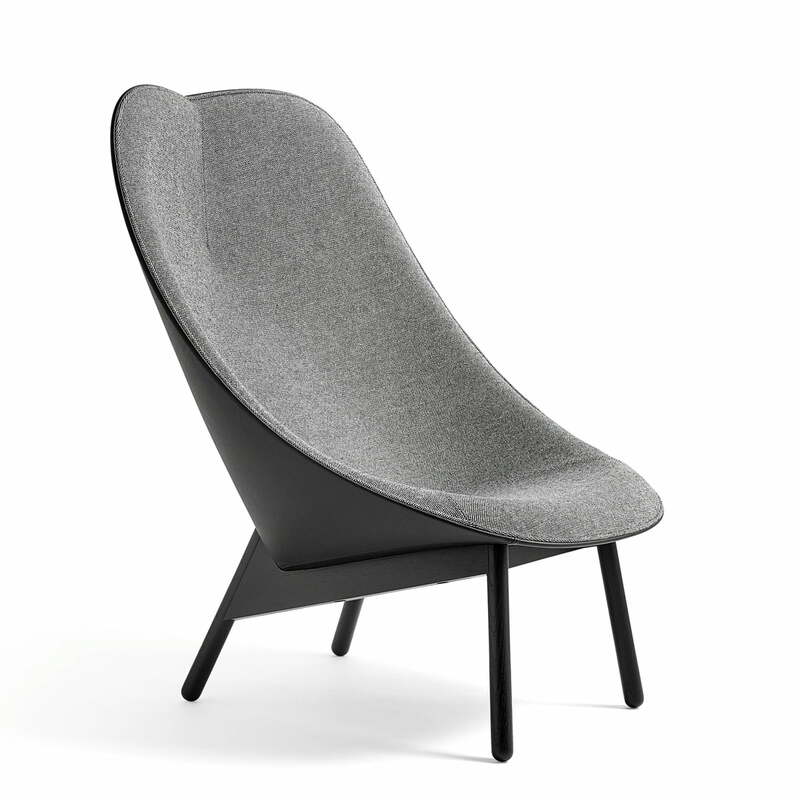 This Uchiwa lounge chair by the Danish manufacturer Hay convinces with its inviting shape and comfortable seat. Designed by Doshi Levien, the shape is reminiscent of a shell, but was inspired by the traditional Japanese hand fan – hence the name Uchiwa (eng. fan). The angular lines of the back offer an exciting contrast to the soft, round inside of the shell. An intimate atmosphere in which to relax is created by the curved shape. The shell was cast from polyurethane and padded with a thick layer of foam. 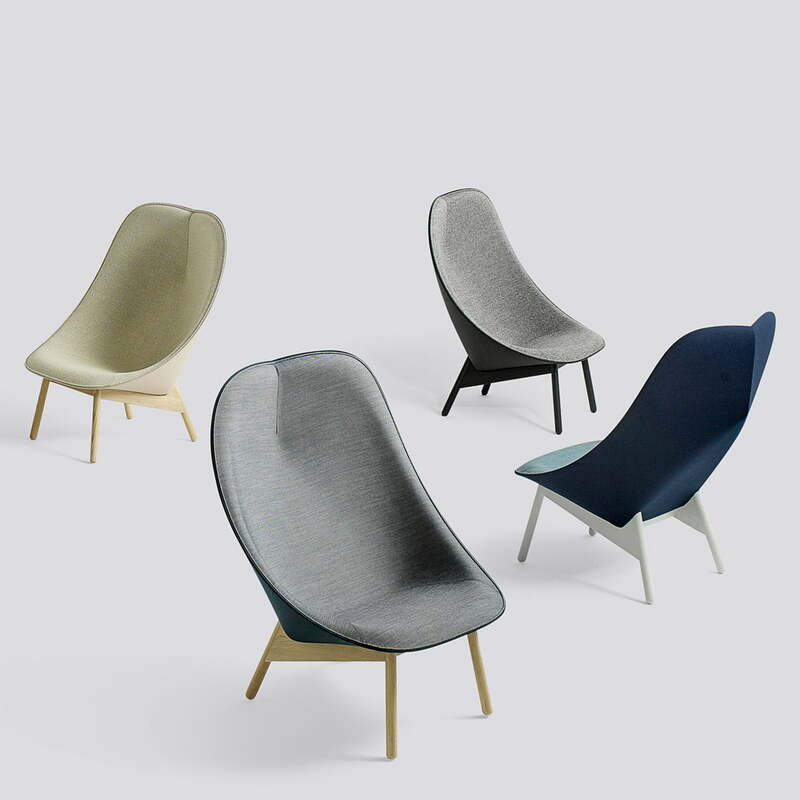 For the upholstery, Hay uses a high-quality, mainly wool-based fabric and leather, that can be combined at will. Thanks to its original, elegant design, the armchair is very versatile. 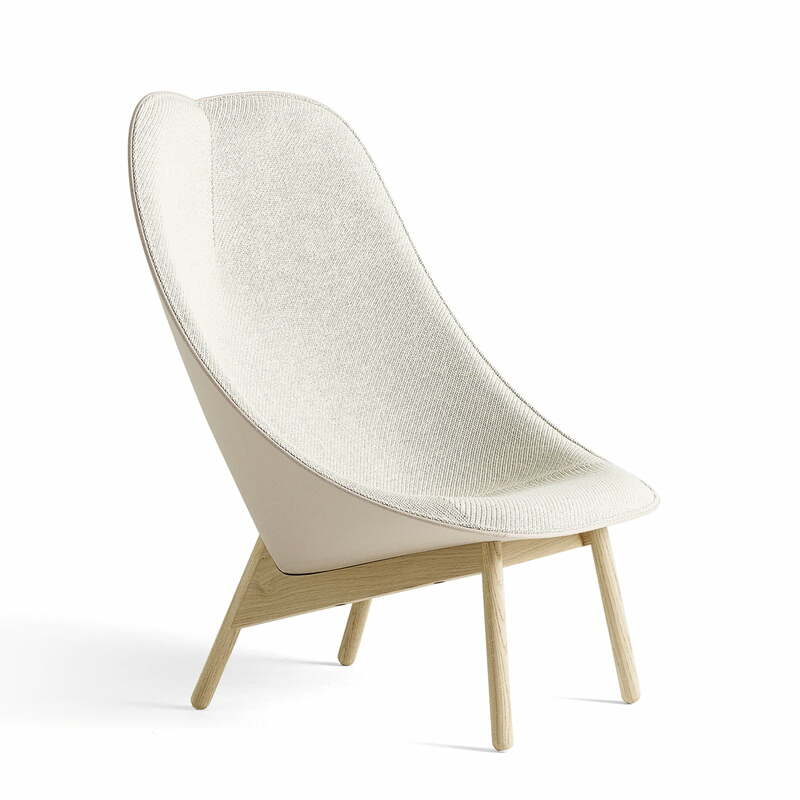 No matter whether in the living room, home office or bedroom - relaxing in this cozy armchair is simple. It is ideal to just sit and think, read a good book or chat with friends. 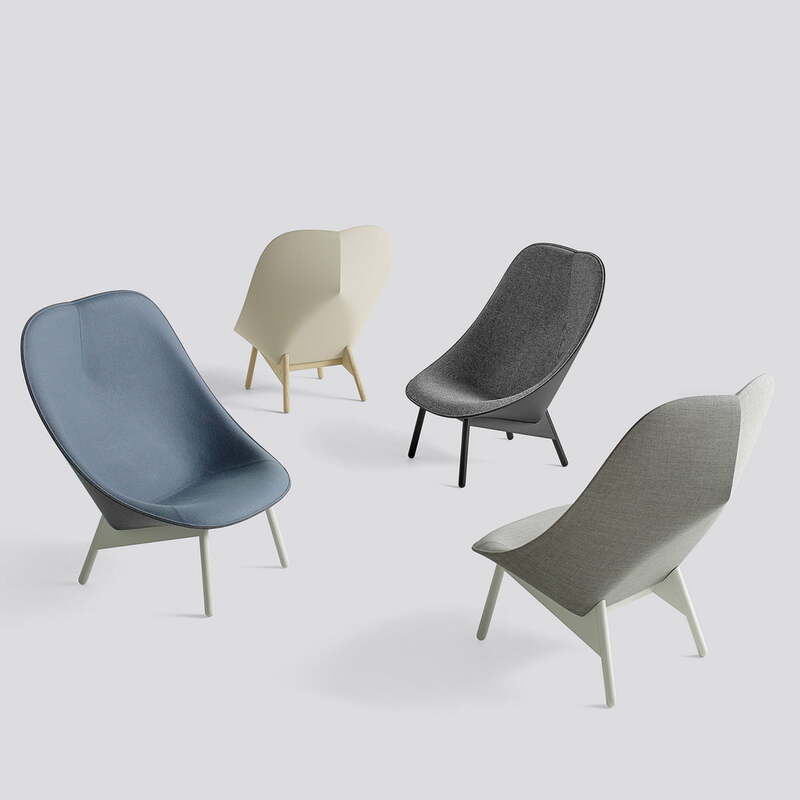 The upholstery for the seat and back are available in different colours and fabric compositions. For an individual configuration, please contact our customer service. 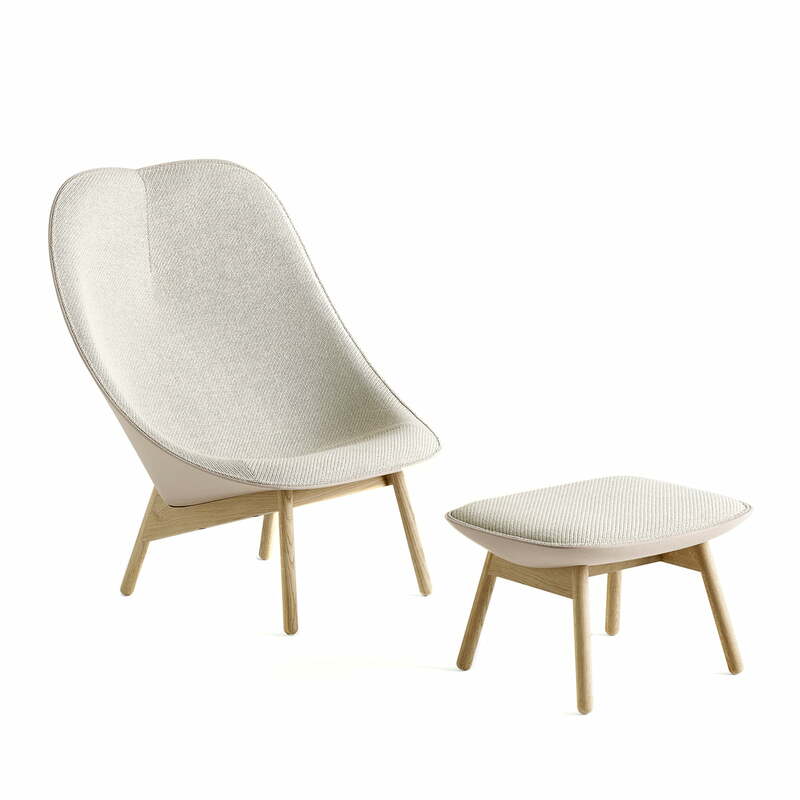 The Uchiwa armchair by Hay in soaped oak and beige: This Uchiwa lounge chair by the Danish manufacturer Hay convinces with its inviting shape and comfortable seat. 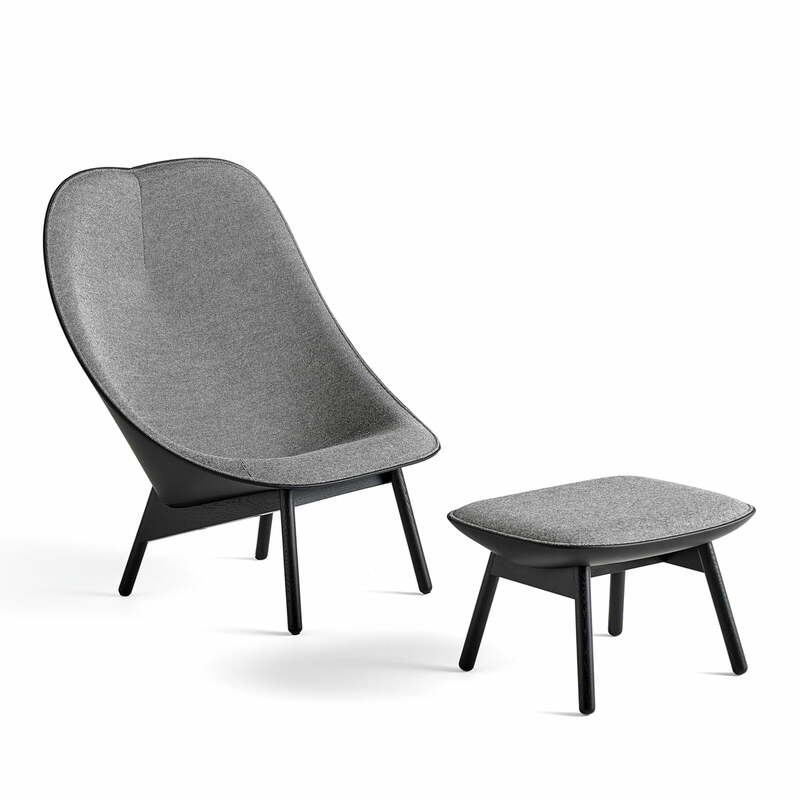 Isolated product image: Side view of the Uchiwa armchair by Hay with a black stained oak frame, Hallingdal seat upholstery (166) and a black leather back. 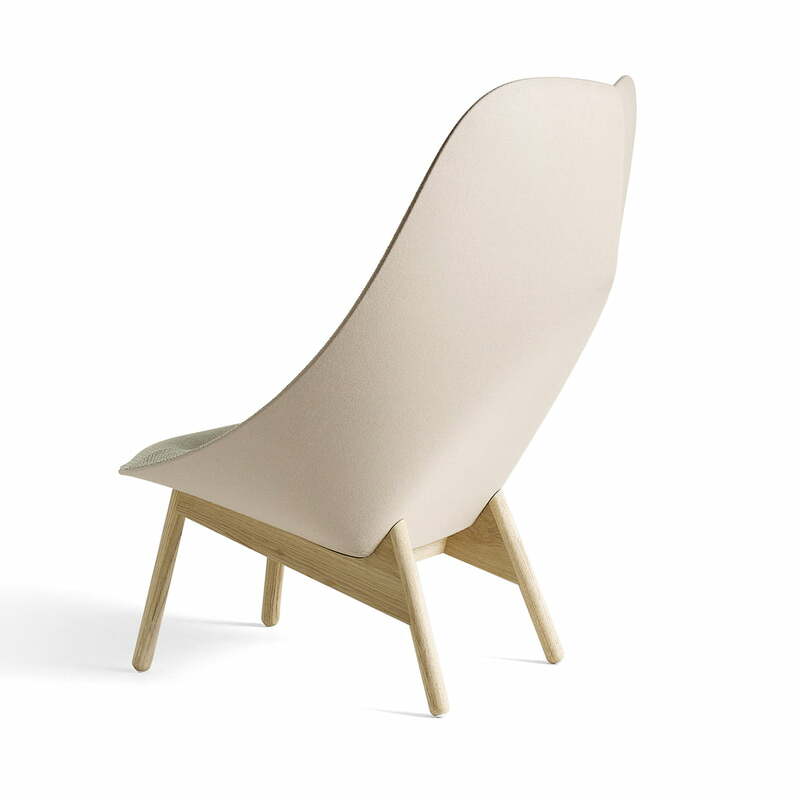 The back of the Uchiwa armchair by Hay in soaped oak and beige The angular lines of the back offer an exciting contrast to the soft, round inside of the shell. 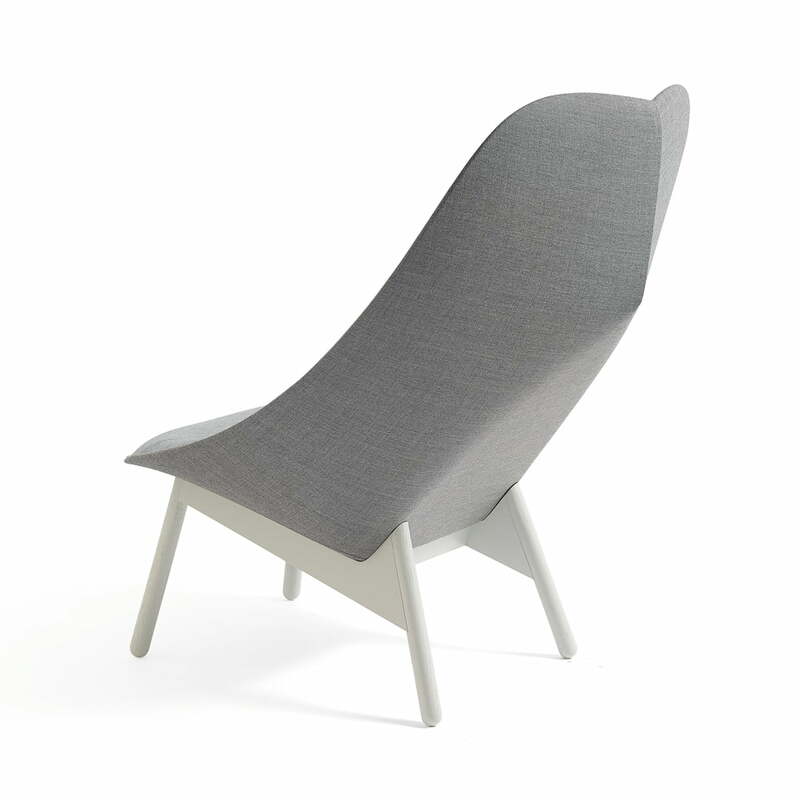 The back of the Uchiwa armchair by Hay in stained light gray oak and gray The angular lines of the back offer an exciting contrast to the soft, round inside of the shell. 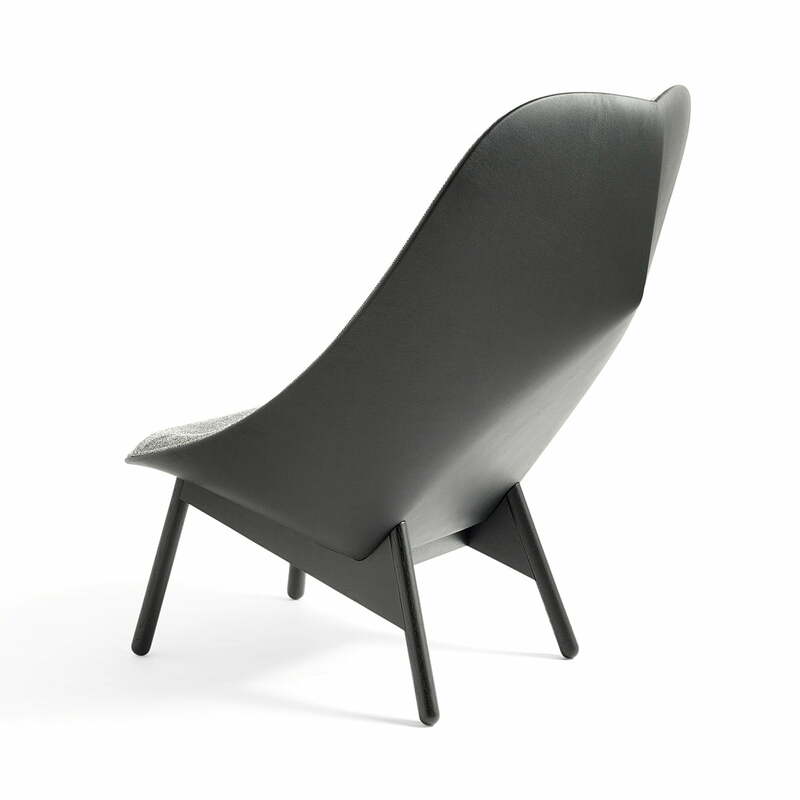 The back of the Uchiwa Chair by Hay with a frame in black stained oak and a gray seat (Hallingdal 166) convinces with leather in black (sierra black 02). The Uchiwa armchair by Hay in black stained oak and leather with the matching stool are ideal to just sit and think, read a good book or chat with friends. Group illustration of the Uchiwa armchair by Hay in Soaped Oak and Beige with Stool With the matching Ottoman, the armchair becomes even more comfortable and inviting. 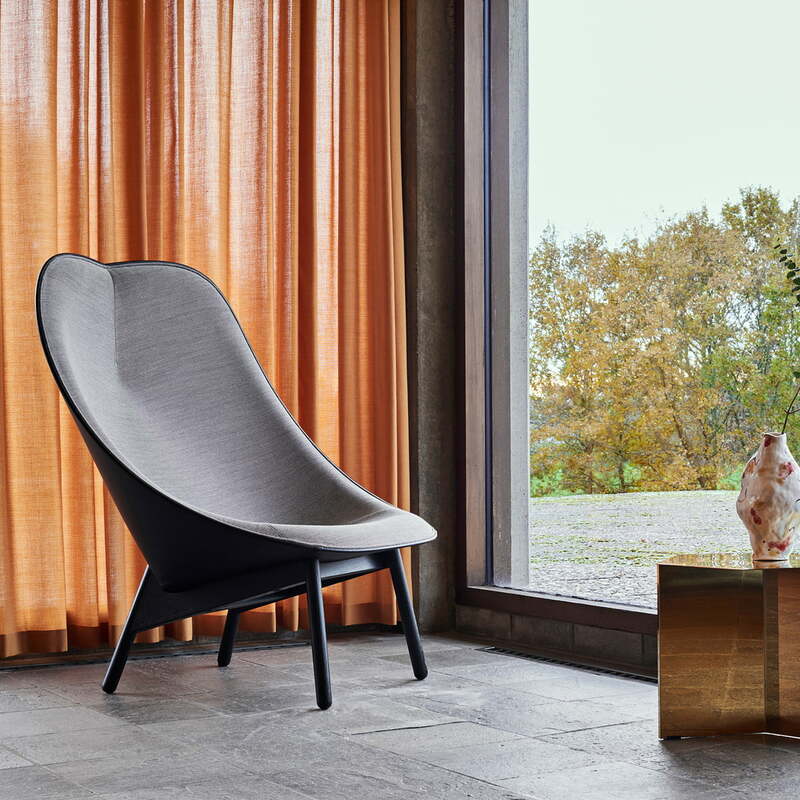 The Uchiwa armchair in an ambient setting: Whether in the living room, home office or bedroom - relaxing in this Uchiwa armchair from Doshi Levien for Hay is easy. Group illustration: The upholstery for the seat and back come in different variations. In addition, the feet out of solid oak are available in different colours. The shell was cast from polyurethane and padded with a thick layer of foam. For the upholstery, Hay used a high-quality, mainly wool-based fabric and leather, that can be combined at will.